Triveni Sangham is the confluence of the three rivers Ganga, Yamuna and the mythical Saraswati. While the muddy brown waters of Ganga and the translucent green of Yamuna are clearly visible, it is believed that Saraswati, flows and meets these two rivers underneath the surface. This is also believed to be the spot where the drops of holy nectar fell, thus sanctifying it. A wash here is believed to free one of all sins. 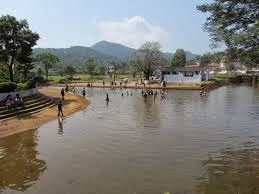 In fact so sacred is this spot that legends have it that even Gods have a dip here to wash off their sins! You can hire the services of the several boats anchored here to take a dip. This Sangham is especially crowded during the Kumbha and Ardha Kumbha Melas.